The petition by the “Academicians for Peace” in Turkey has resulted in an assault against the academic community of the country, which resembles the practices of the military junta of the September 12 1980, coup d’état. The petition itself and the reactions for/against it have gained a different momentum following the increasing pressure by the AKP (the governing political power) via various channels such as university administrations, legal bodies and partisan media organizations. Each indictment such of “disloyalty,” “mandate support” and “treason” directed at the academicians by the Turkish President Erdoğan, the Prime Minister Davutoğlu, several ministers and other officials, have brought new accusations and threats against the academicians that were put on the target. The names of the academicians were published by pro-government newspapers. This not only escalated the oppressive atmosphere in the country, but also increased the violence directed against the signatories. These state charges have acquired a life-threatening dimension. They crystallized with the chilling statement of an organized crime leader: “We will kill them and have a shower with their blood!” Various lynching campaigns have formed via social media. Press Release of the petition of Academicians for Peace, Istanbul, 12 January. Turkish university rectors, whose job it is to safeguard universal, scientific and critical knowledge and the academic staff, have sided with the political authorities. 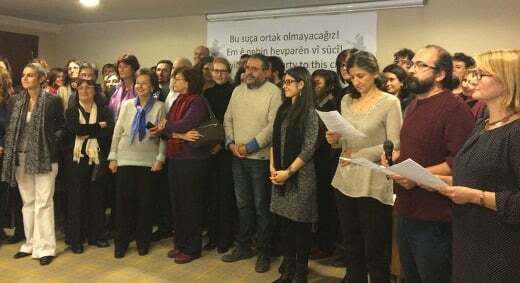 They have declared that: “This petition cannot be associated with academic freedom!” Following the investigations initiated by YÖK (the Turkish Higher Education Council) and some university rectors, several academicians have been dismissed from their universities. Disciplinary proceedings are being coupled with criminal proceedings and a warrant has been issued for the arrest and custody of some signatories. The head of the Turkish Bar Association, whose fundamental duty, is to protect freedom of thought and expression has also made an unfortunate statement against the academicians. In short, the reaction against the petition reflects the consolidation of the Turkish hard right, creating the space for them to take a hatchet to their political, and democratic, enemies. The political and coercive oppression being leveled against the academicians has, in turn, increased the support and solidarity both in Turkey and abroad. Artists, authors, poets, intellectuals, students, civil servants and workers have begun to take side with the academicians. In addition to the “peace demand,” a new political demand has started to gain momentum. The draconian measures taken by the Turkish state is turning the case both into a defense of freedom of expression and thought and of the academy itself. Certainly, the ultimatums of Prime Minister Davutoğlu and President Erdoğan – “Choose your side!” and “We do not rule Turkey by consulting you!” respectively – have played a great role in these developments. As a part of its grand strategy (the so-called new “greater Turkey” project), the Turkish political powers present the petitioners as the “black sheep” of the intellectual community. In recent years, the Erdoğan AKP governments have been quite successful in remaking the political agenda and discourse of the country by stigmatizing the opposition as “enablers” of domestic terrorism and as “domestic enemies” of the Turkish state. Such practices have helped the AKP to implement its policies by manipulating and disorienting active democratic consent and obscuring its own economic and political failures without paying a political price. In fact, these same practices were deployed during the “Ergenekon trials,” the operations against the “Parallel/FETÖ” organization, as well as against the Gezi Square protests in 2013. The “1128s” has become an expression of treachery continually used in the pro-government media, and is the embodiment of this practice. In order to justify its security crackdown, the various branches of the Turkish state invoke the 1128 academicians in every possible occasion. The AKP partisan newspapers call for university students to start a boycott against their professors. In this oppressive and dangerous environment, only a single investigation has been conducted on the crime boss uttering violent threats; whereas a warrant for the arrest of numerous academicians has been issued. Some have already been taken into custody and their offices and houses have been searched and ransacked by police. There is no denying that the political conjuncture in Turkey is coming to represent some of the symptoms of classical fascism: the complex ensemble of the Turkish state and its diverse apparatuses are coming under the control of a single mass party; the political parties are turning into ‘mere parliamentary coteries’ cloaking the concrete ways the state is operating. Prime Minister Davutoğlu has not even criticized the crime boss, which begins to pose the indirect legitimization of a paramilitary structure. Occupational ethics and obligations have been pushed into the background to suit current political interests. Police searching the houses of academicians in Bolu, 15 January. In order to save its face in the diplomatic arena and to address its international image crisis, which has emerged from its foreign policy and the revelations about cooperation between the Turkish state and ISIS, the Turkish government is polarizing Turkish society through both its discourse and the authoritarian remaking of the state. By creating a “domestic enemy,” the AKP government hopes to justify its security policies; to obscure mounting social contradiction; to direct the anger of the Turkish masses to opposition of dissident citizens and organizations. As one measure, the AKP government has initiated a clean sweep of opposition in academic institutions through new organizational mandates, parallel to the ones it pushed through the political system (eventually culminating in the recent shift to a presidential system in Turkey). The French political theorist Jacques Rancière has commented: “ Bad shepherds mislead only sheep and no one is forced to be a sheep. ” But the AKP government desires everyone to be on its side without assessing and questioning the government’s program or operations. Clearly, the initial task is to support the academicians, their legitimate rights to call for peace and for the autonomy of academic institutions from political oppression of the state. The assault against the academic community is an integral part of the AKP’s strategy to remake the Turkish state into its own version of authoritarianism and Islamic ideology. The opposition in Turkey must now also defend the trenches of freedoms in civil society or risk losing them all together. It is the duty of the progressive and democratic forces in Turkey to side with each of the academicians under attack by the legal and civil threats of the Turkish state. And now, it is also time to renew and further develop both national and international mechanisms of support and solidarity. Kansu Yıldırım is an independent researcher based in Ankara and an editorial board member of Kampfplatz (Turkish journal of philosophy and social science). 1. President Erdoğan accused the academics of demanding a “mandate regime” for Turkey because of the call for international observers in the conflict areas inside Turkey. It is a reference to quasi-colonial territories established under the League of Nations in 1919 over parts of Turkey. It is an accusation of extreme vitriol for right-wing Turkish nationalists.